With Ben Bishop, Matt Murray, and Martin Jones already leading their teams to first round victories, the playoffs have once again proved that drafting goalies can be complex. For years, teams have had difficulties identifying future talent of goalies during their draft years. Often times, first round picks don’t pan out. Some never make the NHL. And while some late round picks surprise, others barely progress after being drafted. The goaltenders featured in this year’s playoffs are a unique breed—some have been drafted high, in later rounds, or not at all. Jones of San Jose was never drafted at all. Los Angeles signed him as a free agent and eventually traded him in a package for power forward Milan Lucic. Boston would then send Jones to San Jose for a first round pick. A former undrafted free agent eventually attained the value of a first round pick. With that being said, enjoy some shocking stats about how no one can actually predict a goaltender’s future success…yet. Of the 16 starting goalies from this year’s playoffs, the average draft position (excluding undrafted Jones) was the 103rd pick—an early fourth round pick. 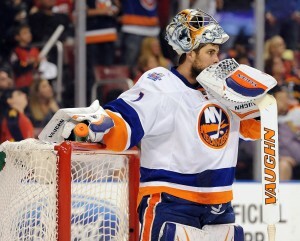 The closest to the pin was the Islanders’ Thomas Greiss, who was drafted 94th overall by San Jose. In their respective drafts, an average of 10 goalies were taken ahead of the 15 drafted starting playoff goalies. 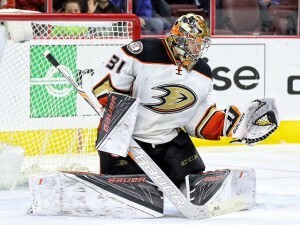 For Anaheim’s Frederik Andersen, 10 goalies were taken ahead of him in the 2012 draft. The 87th pick was also taken in the 2010 draft by Carolina, but did not sign with them and re-entered the 2012 draft. Including Jones, half of the starting goalies are not with their original teams. Of the eight on different teams, Greiss is on his fourth NHL team and Minnesota’s Devan Dubnyk is with his fifth organization. Additionally, half of the playoffs’ starting goaltenders hail from Canada. Not surprisingly, our neighbor to the north has produced most of the goalies in this year’s playoffs. As for the others, Finland and the United States have each produced two goalies and Sweden, Switzerland, the Czech Republic, and Germany each have one goalie starting. In addition, goalies mature at different rates. As the average draft spot and number of goalies picked ahead clearly indicated, just because a goalie was selected in the first round, it doesn’t mean that he will be better than goalies drafted later. On average, it has taken the playoff goalies over two full seasons just to reach the NHL after being drafted—let alone achieve starter status. And often times, it takes longer than two years for goalie to reach the NHL. Look at Dubnyk for example. He was a 2004 first round pick, didn’t reach the NHL until the 2009-10 season, and really didn’t establish himself as a starter until last season. On the contrary, goalies like Andersen, Pekka Rinne, and Kari Lehtonen only needed one full season of development before reaching the NHL. Goalies are odd creatures. And the starting crop from this year’s playoffs are perfect examples of that. It really goes to show that past attempts to scout and develop goalies has been hit or miss. For arguably the most important position on a hockey team, the analysis of a goaltender’s skill is still pretty basic. If teams used former goalies with strong attention to detail to evaluate draft-eligible tenders, they’d likely have a better synopsis of which goalies are the best in the draft class. And, when coupled with NHL-wide draft rankings, teams could opt to draft the goalie around his original projection and come away with a steal later on.